Yummy! Old Fashioned Coconut Meringue Pie just like grandma use to make. 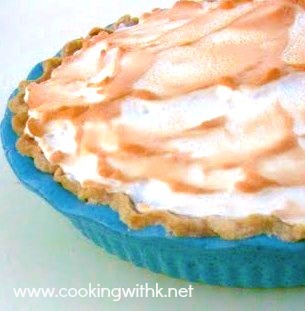 Get the recipe to make the perfect pie filling and a secret to keep the meringue from shrinking!! I found out this morning that today is National Pie Day. Not knowing this yesterday, I made a Coconut Meringue Pie and an Old Fashioned Butterscotch Pie to take to our Life Group Meeting this evening. How cool is that! I must say that memories come flooding each time I make my Mother's recipe for Coconut Meringue Pie. Growing up, my Mother was the Pie Making Queen. She could turn out pies like nobodies business, especially around any holiday. Coconut Meringue was the favorite with Chocolate Meringue right behind, and it was not unusual for her to make two pies of any kind each time she made them. Mother's coconut filling is rich and creamy with just the right amount of coconut to give it that distinct coconut flavor. Her homemade meringue is fluffy and rich, and the coconut she sprinkled on top looks pretty, and just adds some more of that yummy coconut flavor. yippee! You just never know what the day is going to be when you wake up in the morning, do you? Preheat oven to 350 degrees F. In a large heavy saucepan, add sugar, flour, milk, and egg yolks. Turn heat to medium and cook for 10-12 minutes while stirring the entire time. Filling should be thick and creamy. Remove from heat and add vanilla, butter, and coconut; Set aside and make the meringue. 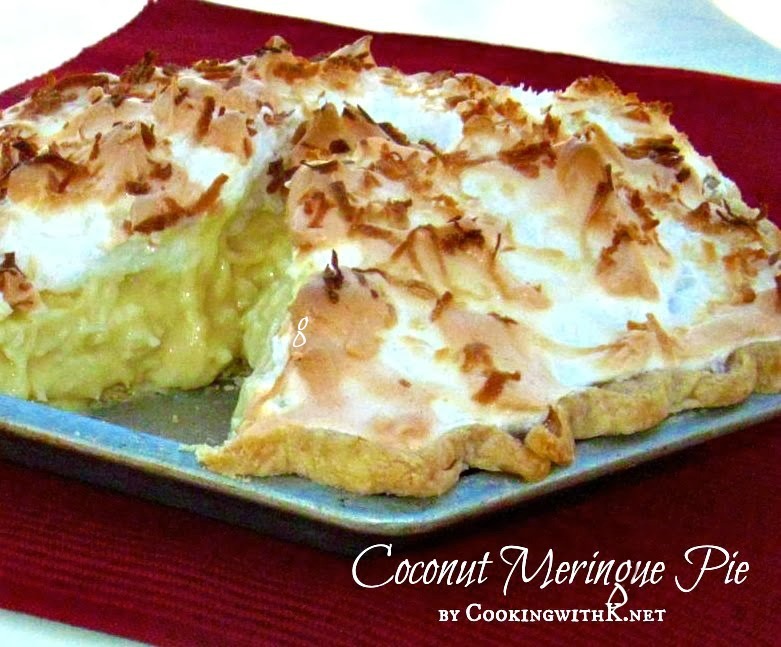 Pour slightly cooled filling in cooked pie crust and spread meringue evenly over coconut filling, sealing edges to crust. (This is real important for the meringue not to shrink when baking). Sprinkle with flaked coconut. Bake for 10-15 minutes or until the meringue is golden. Cool for 1 hour. Refrigerate for at least 3 hours before serving. Yum! 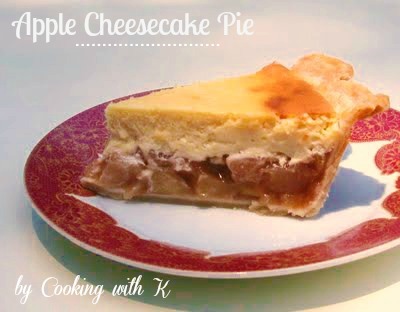 This is my oldest daughter's favorite pie, and your recipe looks much healthier than mine. Thanks K! Are you posting your mom's chocolate pie recipe? Chow and Chatter ~ thank you you...you are so "sweet". Rhondi ~ Yes, I am going to post that one too....I will be making one sometime before Valentines. Aren't mothers just wonderful when it comes to delicious things? But, from the looks of your pie, you're a pie making queen yourself. This looks super and your meringue is so fluffy. Thank you so much for coming and linking up with Sweets for a Saturday. I truly appreciate your support. Hope to see you again next week. I have never heard of coconut meringue pie, but it makes good sense with the eggs and using them all. This looks and sounds wonderful. That's a lovely looking pie! Stopping by to say thank you for following my blog. You have a lovely site here. Will definitely stop by again. Have a lovely week! Delicious, and looks so, so good! Wow that looks delicious! I've never made a Coconut Meringue Pie but your recipe looks pretty easy to follow. I think I will add it to my list. Love it! Thanks for linking up to Sunday Suppers!! I sure wish I had a slice of that pie right now. My Mom made a Coconut Pie that was my favorite. Your recipe looks very good. I would like to invite you to bring a dish to my Full Plate Thursday. Thank you for sharing and you have a great week! Whenever I see coconut I come running. I can't get enough of it. Your meringue is beautiful, I can never get meringue quite right, I'm not sure why. Coconut pie is my absolute favourite pie. Would love a slice of yours right now! cool! i am making a coconut cream pie this weekend! love this meringue one tho! Hi stopping by from Mom's Sunday Cafe, I included this wonderful post in my Wednesday and wandering series. Have a great day! You are a stylish blogger! Stop by to see. Enjoy your day. This pie looks so divine! Yum! Love that pie pan! Is it an antique? Very cool. 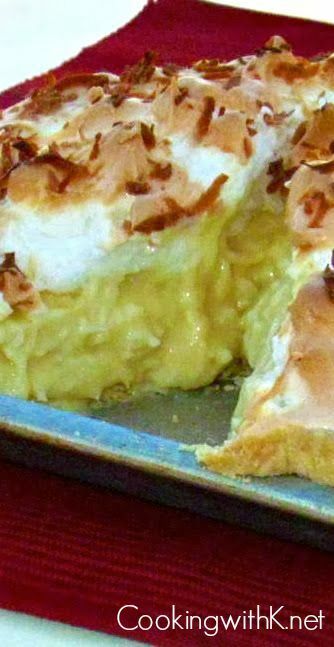 Coconut Meringue Pie is my husband's most favorite pie, food, dessert . . . All of the above. This recipe just became our favorite, The pudding was just perfect, not too runny or too stiff. I've been trying different recipes, since we married 8 years ago . . . The search is over. Thanks a million for sharing. Thanks for the recipe. I have never tried that one. I love meringue and coconut. Your pie looks so tasty. My daughter loves Coconut cream pies so I am sure she will love this. Thank you for the recipe. My mom is one of the best cooks ever and Coconut Meringue Pie is her very favorite to bake (and eat). Her health has not been good, so she has not made one in ages. Well, today is her 69th birthday and I made this pie for her. I am not nearly the cook that she is, but I wanted to surprise her with something she loves. IT WAS PERFECT! She loved it. Thank you so much for the great recipe and the even better memory. After all, isn't that what cooking is all about? Elizabeth you brought tears to my eyes as I read your comment to my husband...so glad it turned out great...but more than that...your mom enjoyed it! Coconut and meringue in pie form sounds heavenly. Thank you for sharing the recipe so generously. I'll give it a try when my kitchen remodeling nyc team finishes their work! Oh my K! This looks fantastic. I'd so love to try this but I'm afraid I'd be the only one who'd eat it. Now, wouldn't that be a shame! LOL Thanks so much for linking up with me last week on "Thriving on Thursdays". The party starts again in a couple hours (Thursday our time here in Australia) and I'd love for you to stop by again if you get a minute. I loved it! I tried your recipe and it was the best one we ever had in years. In fact, you could start your own catering NYC services! Good job. I love your recipes. Do you have a cookbook for sale? I would love to purchase several of them if available. My sisters and my son and daughter would really enjoy a copy. Thanks.